This position can arise in the contact play variations of the 3-5 point low approach one-space low pincer. 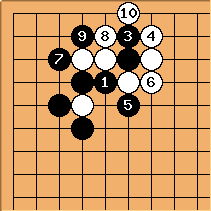 In that joseki White has a chance to play either of and ; and in some cases plays both as here. as shown completes a table shape. Here Black has the atari at a to work with; but there are also two cuts for Black to worry about, one on the left side and another on the top side. 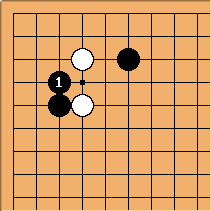 There are two possible ways in which this double-contact position could have arisen: White might have played first, with Black hane as answer; or White might have played first. 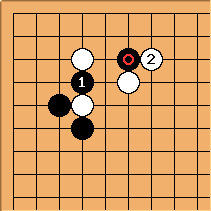 Evaluating this as joseki therefore involves several questions. Does the result shown favour White, and what continuations are there from here? Is there a better order for White: is then better or the other way round? What are Black's resources for avoiding this result, assuming it favours White in a given game position? 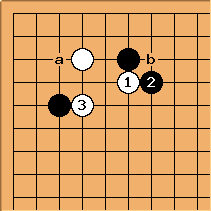 This way to play with may be classical; but it is still used in pro games (by Kato Masao in 2002). When is played Black may well answer at a; but also has a chance to try b first. Both of these are pro plays. When Black plays , is the common answer. This is surprising, since Black can now make a ponnuki. 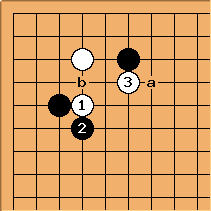 If the premise for Black playing at in the first place was influence on the upper side, White might be content for this kind of trade-off to occur. 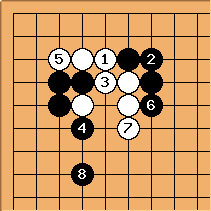 If White settles in the upper left then Black's influence in one direction has been negated; even if it transfers to the left side. 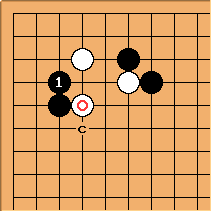 This diagram illustrates that kind of result, with Black sacrificing two to get good value. In this case is expected, but there are other pro moves at a or b that might happen. 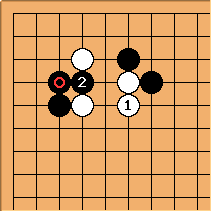 Black however may well vary with here rather than hane. In fact recent evidence relating to the play is sparse; but rather than c seems to be preferred. Thus this result may well ensue, and needs evaluation. This sequence may not have been played for quite a while. Black has developed on both sides, and that is usually taken to be overall success. The evidence is therefore that the order with the left-hand contact play is better for White, if looking for this table play exit to the centre. 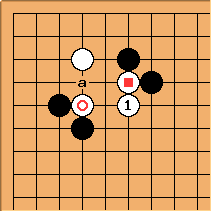 In support of that theory, here was played by Kitani, but is probably not accepted as joseki.